A clamp to secure adjacent pieces of stage decking to one another. Part of the Spider stage system. 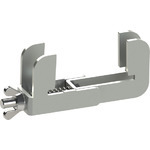 The clamp inserts into the side profile of the pieces of decking to be joined and tightens with an M6 Allen bolt for a strong yet unobtrusive connection. 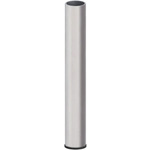 Durable and lightweight stage legs; part of the aluminium modular stage system. 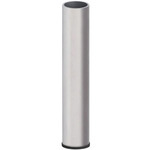 The cylindrical design features an internal screw thread that corresponds with the corner stems of aluminium modular stage system decking (853.900/901/902/903UK, sold separately), for a secure and stable fit. Intuitive and easy to use. A clamp to secure adjacent pieces of stage decking to one another. Part of the aluminium modular stage system. Attaches underneath the stage decking for a strong yet unobtrusive connection. Hand tightens with a wing nut and bolt. 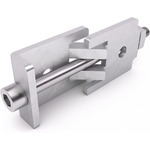 A heavy-duty steel clamp for securely connecting handrail sections to one another. 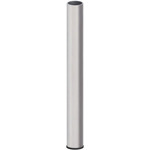 Suitable for Spider and aluminium stage system handrails. 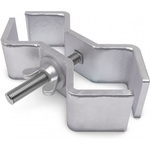 The clamps are easy to fit, with a tightening wheel enabling simple adjustment by hand. 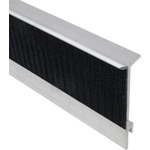 Edge profile for Spider and aluminium modular stage systems, with hook-and-loop fastening to attach pleated stage skirts (853.960UK, sold separately). 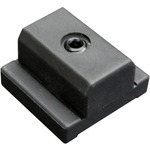 Easy to attach; simply clips into the outer edge of the stage decking. 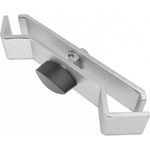 Available in lengths of 975mm and 730mm; the shorter version allowing space for handrail clamps.